This is an excerpt from Shawn & Maile Smucker's new book, How To Use a Runaway Truck Ramp. I've not yet finished the book, but have enjoyed what I've read. Except the scary part about heights. I'm terrified of heights. And bees, but there haven't been any of those in the book. We had pulled away from the scenic view at the top of Teton Pass. Breathless. Anxious. Eager to have the ensuing four-mile descent behind us. It wasn’t long before I had realized we would be fortunate to make this stretch without incident. Even in first gear, I had to use my brakes too often, too hard. The air pressure dropped. The brakes smelled hot after just half a mile. I pulled into a side pull-off area to give the bus a rest, and my parking brake barely engaged. Adrenaline left me feeling shaky. I opened the bus door. The cold air felt great, and behind us, the mountainside was covered in snow, but both were contrasted by the smell of hot brakes. The smell of something important not going well. After ten minutes or so, I released the brake and began creeping forward. The brakes felt okay, but not quite right. I had no idea what to do, but then, I saw another pull-off a few hundred yards ahead. I decided to pull in there and park for an hour, let the brakes cool completely. We might take all day getting down. Oh, well. By now, Maile and the three older kids sat just behind me. Sam napped in the back. The kids chattered on and on about the view, the trees, and the bears they wanted to see. It was surreal – inside, I felt a massive sense of tension nearing panic, yet just behind me the kids were having a great trip. They had no idea. I pulled our 20,000 pounds into that next pull-off, preparing to stop, put on the parking brake, and wait until the brakes cooled. But it was at that moment I realized we couldn’t stop, at least not completely. I pushed the brake all the way to the floor, but we kept coasting, a snail’s pace really. It’s amazing how immense fear can rise up in the face of such slow movement. In a last ditch effort, I pulled on the parking brake, but it did nothing. We kept coasting forward. A guardrail defined the next curve, to the left, just a hundred yards or so ahead of us. Beyond that road, a thousand feet of air and rock and evergreens. Faster. Soon, we were going fifteen miles per hour. We came around the turn. I began calculating at what point I would need to wreck the bus into the side of the mountain. The brakes no longer slowed us at all. Then, we saw it – on the left, a runaway truck ramp, the kind I used to always look at and think, Seriously? People actually use those? 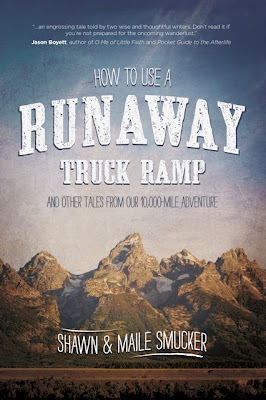 Shawn Smucker is the author of How to Use a Runaway Truck Ramp and Building a Life Out of Words. He lives in Lancaster County, PA with his wife Maile and their four children. You can find him on Twitter and Facebook, and he blogs (almost) daily at shawnsmucker.com. Maile blogs at mailesmucker.blogspot.com. Don't buy something your intended recipient won't like. Do buy something your intended recipient will like. We are conducting interviews today in an effort to find my replacement. Help me spice it up for the candidates by giving me some funny or odd questions to ask. I can't ask how old you are, but...were you eligible to vote last month? What size shoes do you wear? We're looking for someone who can fill mine. Although I'll probably take them with me, so you should just use yours. Yours look like they fit pretty well anyway. Would you like to get me some coffee? Do you hate celery, I mean salary? Remember the last time I resigned? Well, I did it again, but this time it didn't go over nearly as well. What fun conversations have you had with your boss?